This weekend's rare supermoon total lunar eclipse will offer a mix of risk and scientific opportunity for a NASA moon-orbiting spacecraft. Earth's nearest neighbor will be plunged into darkness Sunday evening (Sept. 27) North American time, during an eclipse that takes place when the moon is closest to Earth during its elliptical orbit (and therefore looks abnormally big and bright in the sky). The event will thus be a "supermoon" total lunar eclipse — the first such eclipse since 1982, and the last until 2033. "We have a method, and it works well," science operations planner Dawn Myers, of NASA's Goddard Space Flight Center in Greenbelt, Maryland, said in a statement. "It's always stressful during the approach of the eclipse, but we follow the same procedures every time, and we haven't had any trouble." Those procedures originally involved shutting down LRO's systems to save battery power and simply riding out the eclipse until the sun came out again. 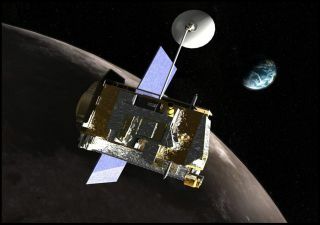 But as mission team members gained experience over the years — LRO launched in June 2009 — they grew confident enough to take some data during lunar eclipses. For example, during recent eclipses, LRO has kept its Diviner instrument on, tracking surface temperatures as the moon has moved from sunlight to shadow to sunlight once again. These temperatures can swing dramatically, changing by about 280 degrees Fahrenheit (156 degrees Celsius) in just a few minutes, NASA officials said. "The rapid cooling of the surface during an eclipse gives us a view of how the top few centimeters cool differently than during a normal lunar night," LRO deputy project scientist Noah Petro, also of NASA Goddard, said in the same statement. "From this, we learn about the size of particles at the surface." LRO will also likely leave its star tracker and some heaters on during the eclipse, to allow for improved navigation, NASA officials said. The $504 million Lunar Reconnaissance Orbiter mission, which is mapping the moon in unprecedented detail, is currently funded through October 2016. The probe is about the size of a small car and carries seven different science instruments (most of which will be turned off during Sunday's eclipse). Editor's note: If you snap an amazing picture of the Sept. 27 supermoon total lunar eclipse or any other view of night sky that you'd like to share for a possible story or image gallery, send photos, comments and your name and location to managing editor Tariq Malik at spacephotos@space.com.